Every Dog owner wants the best for their best friend. They say the love a dog owner has for their pet is akin to that which a parent has for their child. In this post, we look at some of the different Injuries that can occur in dogs and how they can occur. Dogs spend most of their days standing on their toes, with their ankles raised and their knees often bent. This positioning can put a lot of stress on their joints and muscles. Chasing after things, leaping in the air and running about can take its toll. It’s actually very common for them to overdo things now and then. Whether it be their wrists, toes, elbows, hips, knees, ankles or shoulders; strains and sprains are very commonplace. If your dog incurs a strain, this can injure vital tendons in their body. The tendons are a vital part of their body which link the bones and muscles together. If your dog stretches too much, too frequently or further than is normal, this can result in a strain. Strains in the thighs and hips are very commonplace, and can also occur after a fall, a jump or a slip. Sprains can also affect the ligaments which join the bones together, and this can lead to joint damage. Another injury that is also quite serious is called Cranial Cruciate Ligament or CCL; this can be torn and caused a dog immense pain. How to Tell if your Dog has a Strain or Sprain? One of the most noticeable signs that a dog has a sprain or strain is if your dog is limping, they can’t use their leg as normal or if they appear to be lame all of a sudden. If this persists for more than a day, or if it keeps on coming back, then a trip to the vet would be in order. A strain in a dog can come in differing strengths; it can be a mild sprain or a severe sprain, they can also be an ongoing sprain or an acute sprain. The healing process for sprains in dogs typically involves giving your dog some kind of anti-inflammatory drug, to begin with. Some pet owners are fine with this, but understandably, some do not agree with giving their pets drugs of any kind. Herbs for dogs is an alternative, by offering a healing solution that provides faster healing and recovery for sprains, but is safe for your pet and all natural. Turmeric and corydalis are great herbs to start with that are anti-inflammatory and help with pain. Additionally herbs like Du Zhong / Eucommia Bark & Xu Duan / Teasel Root are excellent herbs to help with the tendon injury itself. Alongside this, you want to follow these three simple steps. A muscle tear can be a very painful experience for your dog. When the normal functioning of the muscles is strained or interrupted, this can result in adverse contraction. Generally, it is the weakest part of the tendon that gets torn. It is essentially the action of overstretching that causes a muscle tear in a dog. Another classification of muscle tears in dogs, otherwise known as acute muscle tears can occur after high-impact agility movements, chasing over-enthusiastically after a ball or other object or even playing with other dogs. A common but rarely diagnosed injury is a tear of the iliopsoas muscle. Although there is an elevated risk of muscle tears in dogs who are classified as working or sporting dogs, there is a whole host of reasons that can cause a dog to get a muscle tear. The actual signs of muscle tears in dogs aren’t always easy for pet owners to detect. There are also differing levels muscle tears that your dog can get. However, if your dog appears to be lame, has muscle fatigue (meaning they are extremely tired, more so than normal after very little exercise), they have a pain in their leg, in their lower back, or perhaps they appear to be avoiding putting their weight on one particular side, these can all be tell-tale signs that your dog might have a muscle tear and could be in severe pain. As mentioned above, a muscle tear comes in a range of differing severities. Veterinarians will often group these into Stage 1 (mild), Stage 2 (moderate) or Stage 3 (Severe). The severity of the tear will ultimately determine what the exact treatment needs to be. As is often the case, Skeletal relaxants for muscle with be prescribed by your Vet, alongside massage therapy, acupuncture or cryotherapy. Various conditioning exercises or range of motion workouts could also be recommended, and in some cases, Laser treatment is a viable option. It is dependant upon the type of muscle tear as to which precise course of action will be taken; for example, if your dog has a chronic muscle tear, anti-inflammatory drugs would not generally be recommended because this can impact upon the normal inflammatory process that comes with the healing process. If your dog doesn’t respond to normal treatment, then surgery could be one course of action that is reviewed. Similarly, if your dog has reoccurring muscle tear problems, surgery might also be an option. Also known as DJD, this describes a number of joint conditions that can present themselves in dogs. One of the most common being Osteoarthritis. This is the permanent degradation of the cartilage that is around the joints. Perhaps the more commonly known is Arthritis, which is inflammation of the joints themselves, Osteoarthritis is a little different as this is chronic and is a result of the degradation of the joint cartilage. Generally speaking, older dogs are more at risk, however, just like with us humans, it can be found in their younger counterparts as well. Although there is no defined cause of DJD in dogs as yet, secondary DJD can be brought on after a trauma, birth defect, obesity, dislocation of the shoulder or knee, or abnormal wear on the cartilage. It is also noted that dogs who have hyperlaxity, diabetes or who take steroids for a long period of time are also at risk. The symptoms of Degenerative Joint Disease can vary greatly. A reduced level of activity, reduced range of motion, repeated and frequent lameness, or a rigid gait that tends to get worse after exercise could all be initial warning signs that something is the matter. Some of these symptoms could be brought on by cold weather, periods of little activity or even after exercising. A swelling or deformity of the joints can also be an indication that your dog might have DJD. Knowing your dog is suffering is not easy to deal with. In recent years, the medical treatment of DJD has improved immensely. This is part, are thanks to the advances that have been made in supplements and drugs. There is no actual cure for DJD; however, there is much which can be done to help control the pain and help to reduce the advancement of the disease. Helping to make your dog more comfortable is important. If they are overweight, this will only add to the stress on their joints. Any surgery or medical protocols will ultimately be more effective if their weight is under control. Regular, daily exercise is also a key factor. Massage therapy can also help, and there is much that you, as a pet owner can do at home to help alleviate some of the pain and discomfort caused by this condition. Supplements are also proven to help provide relief to dogs who suffer from DJD and Doggie Herbs offers solutions with proven herbal supplements for dogs that provide targeted relief for dogs in a safe solution with zero side effects. Whatever condition your dog is suffering from, at Doggie Herbs, we understand that as a pet owner, you want to do everything within your power to help your dog to a speedy and prolonged recovery. Doggie Herbs offer a range of supplements that have been lovingly developed by Doctors and Pet Owners to help your dog on the road to recovery. For those looking for an all natural and safe Anti-inflammatory herbs for dogs. 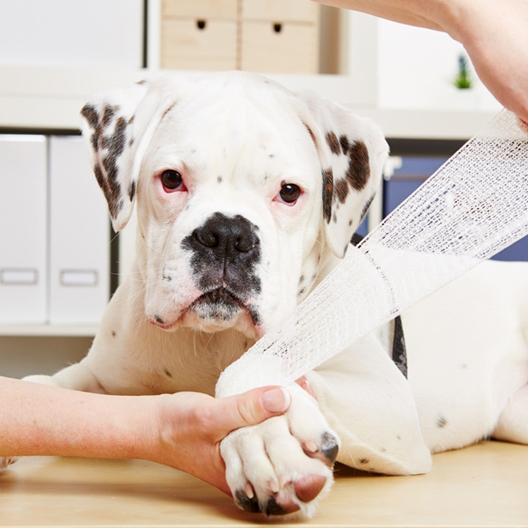 Does your dog have an injury related to weak or injured or sprained tendons / ligaments? We have the #1 Dog Ligament and Tendon Healing herbal remedy for dogs.